Oxygen is one of the basic chemical elements. In its most common form, oxygen is a colorless gas found in air. It is one of the life-sustaining elements on Earth and is needed by all animals. Oxygen is also used in many industrial, commercial, medical, and scientific applications. It is used in blast furnaces to make steel, and is an important component in the production of many synthetic chemicals, including ammonia, alcohols, and various plastics. Oxygen and acetylene are combusted together to provide the very high temperatures needed for welding and metal cutting. When oxygen is cooled below -297° F (-183° C), it becomes a pale blue liquid that is used as a rocket fuel. Oxygen is one of the most abundant chemical elements on Earth. About one-half of the earth's crust is made up of chemical compounds containing oxygen, and a fifth of our atmosphere is oxygen gas. The human body is about two-thirds oxygen. Although oxygen has been present since the beginning of scientific investigation, it wasn't discovered and recognized as a separate element until 1774 when Joseph Priestley of England isolated it by heating mercuric oxide in an inverted test tube with the focused rays of the sun. Priestley described his discovery to the French scientist Antoine Lavoisier, who experimented further and determined that it was one of the two main components of air. Lavoisier named the new gas oxygen using the Greek words oxys, meaning sour or acid, and genes, meaning producing or forming, because he believed it was an essential part of all acids. In 1895, Karl Paul Gottfried von Linde of Germany and William Hampson of England independently developed a process for lowering the temperature of air until it liquefied. By carefully distillation of the liquid air, the various component gases could be boiled off one at a time and captured. This process quickly became the principal source of high quality oxygen, nitrogen, and argon. In 1901, compressed oxygen gas was burned with acetylene gas in the first demonstration of oxy-acetylene welding. This technique became a common industrial method of welding and cutting metals. The first use of liquid rocket propellants came in 1923 when Robert Goddard of the United States developed a rocket engine using gasoline as the fuel and liquid oxygen as the oxidizer. In 1926, he successfully flew a small liquid-fueled rocket a distance of 184 ft (56 m) at a speed of about 60 mph (97 kph). After World War II, new technologies brought significant improvements to the air separation process used to produce oxygen. Production volumes and purity levels increased while costs decreased. In 1991, over 470 billion cubic feet (13.4 billion cubic meters) of oxygen were produced in the United States, making it the second-largest-volume industrial gas in use. Worldwide the five largest oxygen-producing areas are Western Europe, Russia (formerly the USSR), the United States, Eastern Europe, and Japan. Oxygen can be produced from a number of materials, using several different methods. The most common natural method is photo-synthesis, in which plants use sunlight convert carbon dioxide in the air into oxygen. This offsets the respiration process, in which animals convert oxygen in the air back into carbon dioxide. The most common commercial method for producing oxygen is the separation of air using either a cryogenic distillation process or a vacuum swing adsorption process. Nitrogen and argon are also produced by separating them from air. Oxygen can also be produced as the result of a chemical reaction in which oxygen is freed from a chemical compound and becomes a gas. This method is used to generate limited quantities of oxygen for life support on submarines, aircraft, and spacecraft. Hydrogen and oxygen can be generated by passing an electric current through water and collecting the two gases as they bubble off. Hydrogen forms at the negative terminal and oxygen at the positive terminal. This method is called electrolysis and produces very pure hydrogen and oxygen. It uses a large amount of electrical energy, however, and is not economical for large-volume production. Most commercial oxygen is produced using a variation of the cryogenic distillation process originally developed in 1895. This process produces oxygen that is 99+% pure. More recently, the more energy-efficient vacuum swing adsorption process has been used for a limited number of applications that do not require oxygen with more than 90-93% purity. 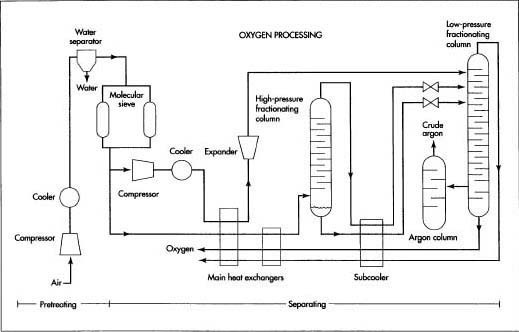 Here are the steps used to produce commercial-grade oxygen from air using the cryogenic distillation process. Because this process utilizes an extremely cold cryogenic section to separate the air, all impurities that might solidify—such as water vapor, carbon dioxide, and certain heavy hydrocarbons—must first be removed to prevent them from freezing and plugging the cryogenic piping. 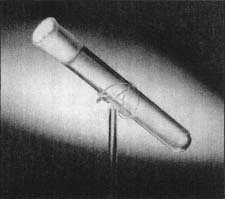 A test tube said to contain the last breath of Thomas Edison and given to Henry Ford, and ardent fan, as a keepsake by Edison's son Charles. This test tube is one of the most popular artifacts in Henry Ford Museum & Greenfield Village in Dearborn, Michigan. It is said to contain the last breath of Thomas Alva Edison, the great inventor. According to Edison's son Charles, a set of eight empty test tubes sat on the table next to Edison's deathbed in 1931. Immediately after Edison expired, his physician, put several of the tubes up to Edison's lips to catch the carbon dioxide from his deflating lungs. Then, the physician carefully sealed each tube with paraffin and gave the tubes to Charles Edison. Charles Edison knew that Henry Ford's idol was Thomas Edison and presented Ford with one of the tubes as a keepsake. The museum acquired the tube after the death of both Henry and Clara Ford. There is some discussion among visitors just how much carbon dioxide and how much oxygen currently is contained in the tube. Some ask if anyone evacuated the tube of oxygen before putting the tube to Edison's mouth (very unlikely). If not, how much of Edison's breath could be in the tube? So, they say, it contains both carbon dioxide and oxygen? Nonetheless, it is an unconventional tribute to a great man by those sorry to see his light extinguished. Before processing, air is pretreated to remove impurities that will clog the cryogenic piping. Once pretreated, the air is submitted to fractional distillation. In the fractional distillation process, the components are gradually separated in several stages. Because all distillation processes work on the principle of boiling a liquid to separate one or more of the components, a cryogenic section is required to provide the very low temperatures needed to liquefy the gas components. Once the liquid oxygen is separated, it is purified and stored. vapor, and the condensed water is removed in a water separator. 2 The air passes through a molecular sieve adsorber. The adsorber contains zeolite and silica gel-type adsorbents, which trap the carbon dioxide, heavier hydrocarbons, and any remaining traces of water vapor. Periodically the adsorber is flushed clean to remove the trapped impurities. This usually requires two adsorbers operating in parallel, so that one can continue to process the air-flow while the other one is flushed. Air is separated into its major components—nitrogen, oxygen, and argon—through a distillation process known as fractional distillation. Sometimes this name is shortened to fractionation, and the vertical structures used to perform this separation are called fractionating columns. In the fractional distillation process, the components are gradually separated in several stages. At each stage the level of concentration, or fraction, of each component is increased until the separation is complete. Because all distillation processes work on the principle of boiling a liquid to separate one or more of the components, a cryogenic section is required to provide the very low temperatures needed to liquefy the gas components. 3 The pretreated air stream is split. A small portion of the air is diverted through a compressor, where its pressure is boosted. It is then cooled and allowed to expand to nearly atmospheric pressure. This expansion rapidly cools the air, which is injected into the cryogenic section to provide the required cold temperatures for operation. 4 The main stream of air passes through one side of a pair of plate fin heat exchangers operating in series, while very cold oxygen and nitrogen from the cryogenic section pass through the other side. The incoming air stream is cooled, while the oxygen and nitrogen are warmed. In some operations, the air may be cooled by passing it through an expansion valve instead of the second heat exchanger. In either case, the temperature of the air is lowered to the point where the oxygen, which has the highest boiling point, starts to liquefy. 5 The air stream—now part liquid and part gas—enters the base of the high-pressure fractionating column. As the air works its way up the column, it loses additional heat. The oxygen continues to liquefy, forming an oxygen-rich mixture in the bottom of the column, while most of the nitrogen and argon flow to the top as a vapor. 6 The liquid oxygen mixture, called crude liquid oxygen, is drawn out of the bottom of the lower fractionating column and is cooled further in the subcooler. Part of this stream is allowed to expand to nearly atmospheric pressure and is fed into the low-pressure fractionating column. As the crude liquid oxygen works its way down the column, most of the remaining nitrogen and argon separate, leaving 99.5% pure oxygen at the bottom of the column. 7 Meanwhile, the nitrogen/argon vapor from the top of the high-pressure column is cooled further in the subcooler. The mixed vapor is allowed to expand to nearly atmospheric pressure and is fed into the top of the low-pressure fractionating column. The nitrogen, which has the lowest boiling point, turns to gas first and flows out the top of the column as 99.995% pure nitrogen. 8 The argon, which has a boiling point between the oxygen and the nitrogen, remains a vapor and begins to sink as the nitrogen boils off. As the argon vapor reaches a point about two-thirds the way down the column, the argon concentration reaches its maximum of about 7-12% and is drawn off into a third fractionating column, where it is further recirculated and refined. The final product is a stream of crude argon containing 93-96% argon, 2-5% oxygen, and the balance nitrogen with traces of other gases. The oxygen at the bottom of the low-pressure column is about 99.5% pure. Newer cryogenic distillation units are designed to recover more of the argon from the low-pressure column, and this improves the oxygen purity to about 99.8%. 9 If higher purity is needed, one or more additional fractionating columns may be added in conjunction with the low-pressure column to further refine the oxygen product. In some cases, the oxygen may also be passed over a catalyst to oxidize any hydrocarbons. This process produces carbon dioxide and water vapor, which are then captured and removed. About 80-90% of the oxygen produced in the United States is distributed to the end users in gas pipelines from nearby air separation plants. In some parts of the country, an extensive network of pipelines serves many end users over an area of hundred of miles (kilometers). The gas is compressed to about 500 psi (3.4 MPa or 34 atm) and flows through pipes that are 4-12 in (10-30 cm) in diameter. Most of the remaining oxygen is distributed in insulated tank trailers or railroad tank cars as liquid oxygen. 10 If the oxygen is to be liquefied, this process is usually done within the low-pressure fractionating column of the air separation plant. Nitrogen from the top of the low-pressure column is compressed, cooled, and expanded to liquefy the nitrogen. This liquid nitrogen stream is then fed back into the low-pressure column to provide the additional cooling required to liquefy the oxygen as it sinks to the bottom of the column. 11 Because liquid oxygen has a high boiling point, it boils off rapidly and is rarely shipped farther than 500 mi (800 km). It is transported in large, insulated tanks. The tank body is constructed of two shells and the air is evacuated between the inner and outer shell to retard heat loss. The vacuum space is filled with a semisolid insulating material to further halt heat flow from the outside. The Compressed Gas Association establishes grading standards for both gaseous oxygen and liquid oxygen based on the amount and type of impurities present. Gas grades are called Type I and range from A, which is 99.0% pure, to F, which is 99.995% pure. Liquid grades are called Type II and also range from A to F, although the types and amounts of allowable impurities in liquid grades are different than in gas grades. Type I Grade B and Grade C and Type II Grade C are 99.5% pure and are the most commonly produced grades of oxygen. They are used in steel making and in the manufacture of synthetic chemicals. The operation of cryogenic distillation airseparation units is monitored by automatic instruments and often uses computer controls. As a result, their output is consistent in quality. Periodic sampling and analysis of the final product ensures that the standards of purity are being met. In January 1998, the United States launched the Lunar Prospector satellite into orbit around the moon. Among its many tasks, this satellite will be scanning the surface of the moon for indications of water. Scientists hope that if sufficient quantities of water are found, it could be used to produce hydrogen and oxygen gases through electrolysis, using solar power to generate the electricity. The hydrogen could be used as a fuel, and the oxygen could be used to provide life support for lunar colonies. Another plan involves extracting oxygen from chemical compounds in the lunar soil using a solar-powered furnace for heat. Handbook of Compressed Gases, 3rd edition. Compressed Gas Association, Inc., Van Nostrand Reinhold Co., Inc., 1990. Kent, James A., editor. Riegel's Handbook of Industrial Chemistry, 9th edition. International Thomson Publishing, 1997. Allen, J.B. "Making Oxygen on the Moon," Popular Science (August 1995): 23. Air Products and Chemicals, Inc. http://www.airproducts.com/gases/oxgen.html . How small can a portable oxygen tank be and can still be of use to a person on oxygen? Can it be under a pound? and about the size of hand of a 9 year old's hand? I worked on a mobile oxygen unit at RAF Amman Jordan 1952/54. It was a large RAF vehicle about the size of a funiture van. It was driven by a diesel engine. In emergencies we could drive to a map reference and produce Oxygen for breathing purposes planes or hospitals etc. the. Diesel engine would be turned on but power was diverted from the wheels to an air compressor then a clutch to a gas compressor both inside the vehicle. The compressed air passed through caustic soda tubes to remove moisture then a nitrogen separator which left only Oxygen . The gas was fed to a large balloon on top of the vehicle then drawn into the gas compressor and pumped into cast iron cylinders at about 3600 lbs per. Square inch. Which were then transported to the place of need. Oxygen for welding purposes was produced in the build up of purity of the gas for breathing. I need cost of setting up a small plant for commercial Oxygen generation.